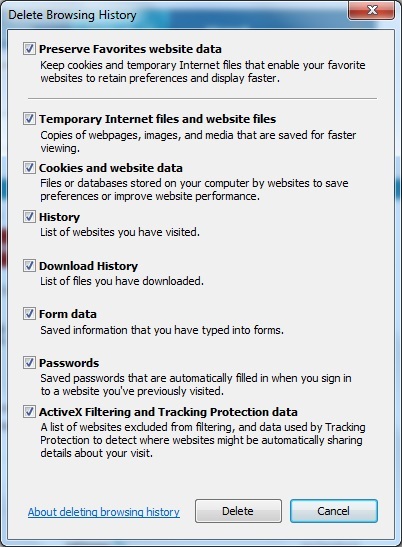 This section provides a tutorial example on how to delete browsing history data saved on your computer when using Internet Explorer 10. Temporary Internet files and website files - Copies of web pages, images, and media that are saved for fast viewing. Cookies and website data - Files or databases stored on your computer by websites to save preferences or improve website performance. History - List of websites you have visited. Download history - List of files you have downloaded. Form data - Saved information that you have typed into forms. Passwords - Save passwords that are automatically filled in when you sign in to a website you've previously visited. ActiveX Filtering and Tracking Protection data - A list of websites executed from filtering, and data used by Tracking Protection to detect where websites might be automatically sharing details about your visit. 1. Click menu: Tools > Delete browsing history... You see the "Delete Browsing History" dialog box showing up. 2. Click on all checkboxes to make them all checked. 3. Click on the "Delete" button to delete the entire browsing history. What Is Internet Explorer (IE)?